After watching them golf for 4 hours and 30 minutes, seven hockey legends decided it was time for a locker room chat with the men and women participating in the 2018 Canada Life Sports Legends Golf Classic on August 13. With the likes of Wendel Clark, Dale Hawerchuk, Mike Gartner, Brad May, Al Iafrate, Geraldine Heaney and current players, Mike Del Zotto of the Vancouver Canucks and Tyler Seguin of the Dallas Stars hovering over the participants in the makeshift clubhouse locker room at King Valley Golf Club, it was time for a chat that few of the golfers will ever forget. Not that winning or losing on the greens was a big deal at the end of the day, as everyone was there for a great day and to raise some funds for the MLSE Foundation, but this was a pep talk that had everyone listening to every single word after a killer steak dinner and some great wine. Sportsnet host Ken Reid, told all to turn off and put away their cell phones with no video taping allowed as the NHL greats and Canadian Women’s Hockey Team Olympic golf medalist, Geraldine Heaney shared some of their most intense and funny moments of their hockey careers with the cheering crowd. As they say, “What happens in Vegas stays in Vegas”, and while Vegas was mentioned in conversation as one of the best cities to visit for a game, much of the 40-minute player chat will remain within the walls of the locker room. That said, some of the stories hit upon topics including Fortnite and other online games, ballet, stealing sandwiches, one of the players admitted to eating steak seven days a week while on the road, breaking curfew at the Olympics, hockey hair, mullets and perms, a possible come back, the 1987 Canada Cup, a 105.9 mph slapshot with a Koho Revolution hockey stick, Dr. Hook and diving, fireworks, Mike Gartner’s Titan Turbo hockey stick that he scored 50 goals with, cotton in shin pads and some F-bombs mixed in. The hockey legends played two holes with a foursome and then dropped back to play two more holes with another group throughout the course of the day. “We played two holes with Tyler Seguin and he was having such a good time with us that he stayed for a couple extra holes. 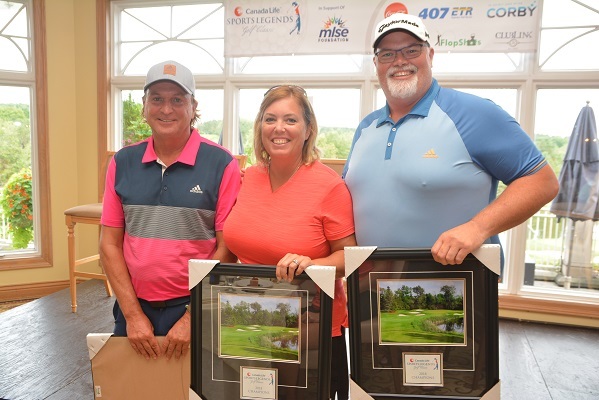 He was awesome, super friendly, and can really hit the ball, not what you might expect from an NHL super star,” said Walsh who was part of a team that finished T2 in the standings at the end of the fun-filled day that included on-course challenges and a raffle in support of the MLSE Foundation. The winning group of the day at 12-under included; Lesley Hawkins, Mark Cathcart, Glenn Townsend and Jeff Feltrin. 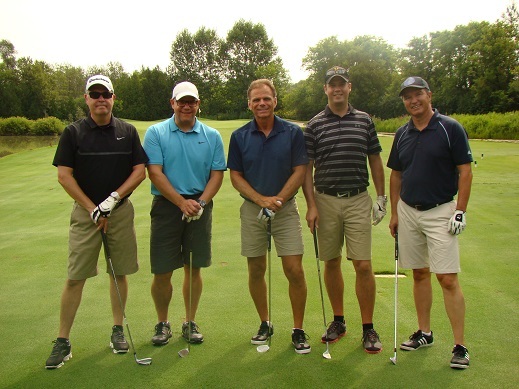 Two teams finished T2 including the group of; Howie Campbell, Richard Reininger, Mike Thompson and Tom Goldspink and the foursome of; Steve MacLellan, Eric Leblanc, Don Guest, Sean Walsh. Tyler Seguin and Mike Del Zotto, who are both members at ClubLink’s RattleSnake Point Golf Club, made their first appearance at the tournament and both were a hit with the hockey fans as they hit towering drives, and assisted with the putting and everything in between. “I really enjoy the game of golf and I play a lot with Tyler at RattleSnake, so to get out here and have some fun with people who love both hockey and golf makes for a great day,” says Del Zotto, who does not play golf during hockey season. He caught up with participants who watched him play Jr. A in Oshawa 12 years ago and others who remembered him with the London Knights 10 years ago, so that was a bit of a blast from the past for the Toronto native. “I enjoy talking about everything not just hockey with them, where to eat when you’re visiting a different city, or what they have been up to this summer. It’s fun to hear their stories and I share a few of mine,” he adds. Geraldine Heaney, a pioneer of women’s hockey in Canada and a two-time Olympic medalist also made her first appearance at the tourney. The Hockey Hall of Fame member shared stories of playing in the first seven Women’s World Championships and two Olympics among other topics.